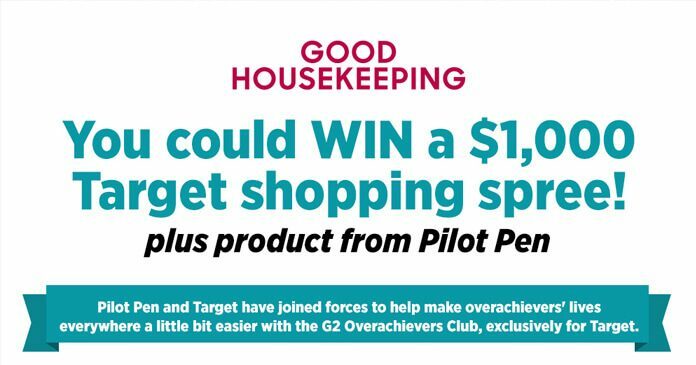 Enter the Good Housekeeping Target and Pilot G2 Sweepstakes by September 11, 2017 and you could win a $1,000 Target shopping spree plus products from Pilot Pen. To celebrate overachievers everywhere, Pilot is providing three winners with G2 Overachievers Target shopping spree prize packs. To enter, go to pilotsweeps.goodhousekeeping.com now and fill out the sweepstakes entry form as directed. Eligibility: The Good Housekeeping Target and Pilot G2 Overachievers Club Sweepstakes is open to legal residents of the 50 United States and the District of Columbia, who have reached the age of 18 in their state or territory of residence at time of entry. Legal residents of Canada (excluding Quebec) who have reached the aforementioned age in their province of residence at time of entry are also eligible to enter. Timing: The Sweepstakes Period is beginning on August 1, 2017, at 12:01 AM (ET) and is ending on September 11, 2017, at 11:59 PM (ET). Limit: Limit one entry per day per person for Sweepstakes. Random Drawing: Winner will be selected on or about September 12, 2017 in a random drawing from among all eligible entries received. Grand Prize: A $1,000 gift card to Target (ARV: $1,000), a year’s supply of Pilot G2 pens (ARV: $100), and an Overachiever Kit, including office supplies, planners, and more (ARV: $50). Winner List: Send a separate self-addressed, stamped envelope to Good Housekeeping Target and Pilot G2 Overachievers Club Sweepstakes Winners’ List, Hearst Communications, Inc., 300 West 57th Street NY, NY 10019 within 2 months from the Winner notification date. Sponsor: Hearst Communications, Inc., 300 W. 57th Street, New York, NY 10019.